The Rijksmuseum needs no explanation. This museum (which was elected for museum of the year in 2015) exhibits the best art the Netherlands can offer. Not only because the Netherlands combines work of Jan Steen, Rembrandt van Rijn, Vincent Van Gogh, Frans Hals and Albert Cuyp. But also because the history of our country is fascinating. 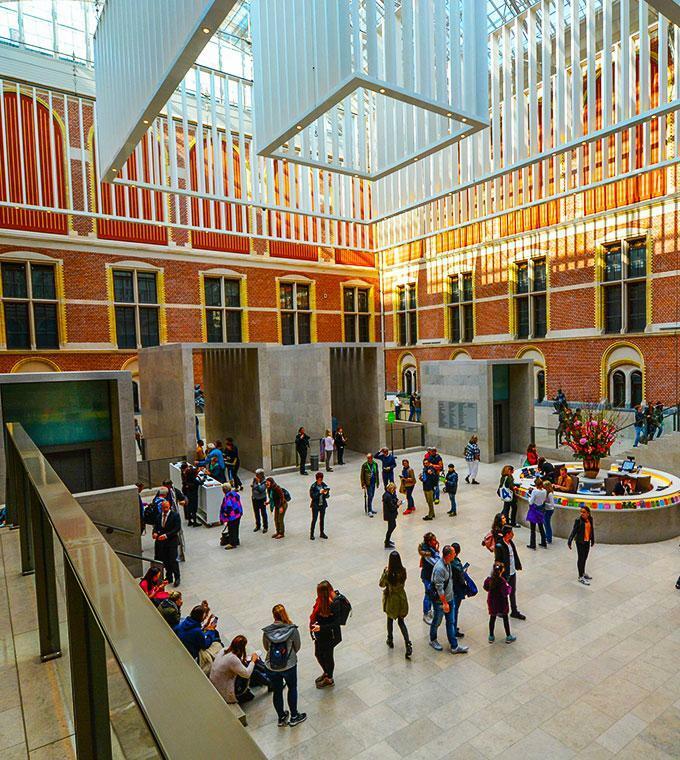 The Rijksmuseum is one of the first museums that takes you through the history of the Netherlands. It combines work of time frames so you understood the process of our history by works of great painters but also of artefacts. The museum attracts many visitors. Therefore it is always better to visit the museum late in the afternoon. Our secret will be that after closing time the museum remains open for visitors that already entered the museum. Therefore when you enter at 4 PM you have enough time to visit all the great works the museum can offer! Only 300 meters from the museum your next highlight will be Amsterdam from the water. The Evening Cruise departures at 6 PM. After your museum visit you will sail through the city where romantic Amsterdam appears. The illuminated buildings, bridges and boats give the city an almost fairytale-like appearance. While you enjoy your drink, you can listen to our audio story in one of the available 17 languages through our Personal Audio System. The cruise departures 300m from the Rijksmuseum. You can find all the information you need on your voucher. Restaurant ´RIJKS´ is one of the high class restaurants of Amsterdam. It is located in the Philips Wing of the museum which is the most beautiful wing of the museum. The excellence of the restaurant expresses itself by following the pattern of the museum. It focuses on authentic, uniqueness and quality. The restaurant houses the best chefs of the Netherlands and from the world (André Chang, Yotam Ottolenghi). You can enjoy the best menu´s Holland can offer. To have an overview click here. Because of the enormous popularity of the restaurant availability is often a problem. ´Evening at the Rijksmuseum´ includes the tickets to the Rijksmuseum, Evening Cruise and a reservation for the restaurant ´Rijks´. In the order process you can decide what time you would like to eat at the restaurant. The Evening Cruise is scheduled at 6 PM. If 4 PM is too late for you you can also decide to enter the museum earlier. The ticket is valid all day. All the selected drinks and menu´s you choose in the restaurants are not included. This great offer makes sure you have to possibility to make a reservation for the restaurant. The prices of the menu´s are not expensive. Check the link to find out. All the information you need you can find on your voucher. Skip the line at the Rijksmuseum, enjoy illuminated Amsterdam and experience Restaurant ´RIJKS´ at the Rijksmuseum.